Stafford went 28 of 38 for 236 yards, but Detroit didn't take many deep shots. 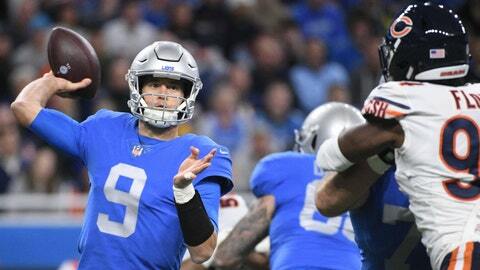 Stafford had an interception returned for a tie-breaking touchdown in the fourth quarter, then had another pass picked off in the end zone with just over a minute remaining in Detroit’s 23-16 loss to the Chicago Bears on Thursday. Chicago was without injured quarterback Mitchell Trubisky, but the Bears’ stellar defense got the best of Stafford. With the score tied at 16, Stafford’s short pass to the left was intercepted by Eddie Jackson and returned 41 yards for a touchdown with 6:00 to play. The Lions (4-7) drove back down the field, but on third down from the Chicago 11, Stafford’s pass was intercepted in the end zone by Kyle Fuller. Stafford went 28 of 38 for 236 yards, but Detroit didn’t take many deep shots. The Lions were playing Chicago for the second time in 12 days. In the previous meeting — a 34-22 win by the Bears — Chicago had six sacks. Stafford wanted to release the ball quickly Thursday, and he was sacked only twice in the rematch, but the Lions looked limited on offense. Detroit was without injured receiver Marvin Jones and injured running back Kerryon Johnson. The Bears (8-3) didn’t have Trubisky, but Chase Daniel stepped in for his third career start, going 27 of 37 for 230 yards and two touchdowns. Still, points were tough to come by, and the Lions were in decent shape in the fourth quarter, taking over at their 41 with 6:09 remaining in a tied game. Then Stafford’s pass intended for Michael Roberts was picked off by Jackson and run back to the end zone. There was still plenty of time, and before long, Detroit had first-and-10 from the Chicago 12. After a short run and an incompletion, Stafford threw to the right side for Roberts, but the receiver didn’t go where Stafford’s pass did — toward the back corner of the end zone. Instead, Fuller intercepted the pass . Stafford was asked if he expected an interference flag, since Roberts’ route may have been impeded a bit.